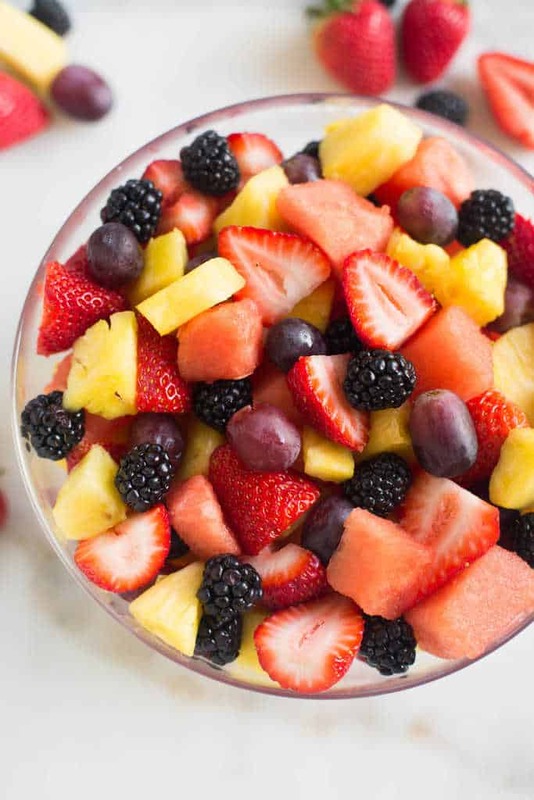 Take advantage of your favorite seasonal fruits to put together the BEST fresh fruit bowl! I’ve got a few easy tips for cutting, storing and assembling your fruit so that it tastes and looks amazing. If there were ever an award for most beautiful fruit bowl presentation, my mom would win, hands down! A huge bowl of amazing, fresh fruit was a staple at our house growing up, pretty much all year round. I never thought anything of it because it was such a normal part of our meal time. Now that I have a young family of my own I also love to have tons of fresh fruit to serve with almost every meal. Fresh fruit, especially raspberries and blackberries, qualify as “treats” for my kids. If they eat their dinner all gone then they get a bowl of fruit at the end of the meal. You wouldn’t believe how motivating that is for them 🙂 I love it. Fruit is so sweet and delicious it should get us just as excited as candy does! My mom taught me at a young age some tips for making a great fruit bowl, including how to cut the fruit and how to store it. Here’s a great seasonal produce guide to help you determine which fruit to use. Tips for choosing a watermelon: Tap the watermelon and listen for a deep hollow sound. Tips for choosing a pineapple: Choose one that has healthy green leaves, a firm “shell” and is golden-yellow in color. You can also smell it to make sure it smells sweet. Cut the fruit into small pieces. It’s easier to serve, easier for people to eat, and it looks prettier in the bowl! Watermelon: This is a photo tutorial for how I cut my watermelon. I cut it in half, lengthwise and the cut those in half again so that I have 4 quarter “wedges”. Then I use my knife to slice it into pieces, and sweep the knife along the line of the rind at the bottom of each wedge. I use this same method for cutting my pineapple (just remove the rind from the center of each wedge). Have you ever bought a pre-cut mixed fruit bowl from the store? Although they look delicious and appealing, you’ve probably noticed they never taste as good as they look. When all of the fruit sits together in a container for a long period of time, all of the flavors start to blend together. Do you know what I mean? That’s why I always like to mix the fruit together right before serving. The best way to prevent the flavors of the fruit from all blending together is to store the fruit in separate gallon-size ziplock bags after you cut it! Stick a few folded pieces of paper towel in the bottom of the ziplock bag to help soak up some of the excess juice. 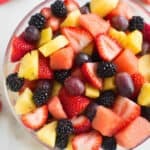 When you’re ready to serve, simply grab the bags of various fruit from your fridge, add them to your serving bowl and gently toss to combine. 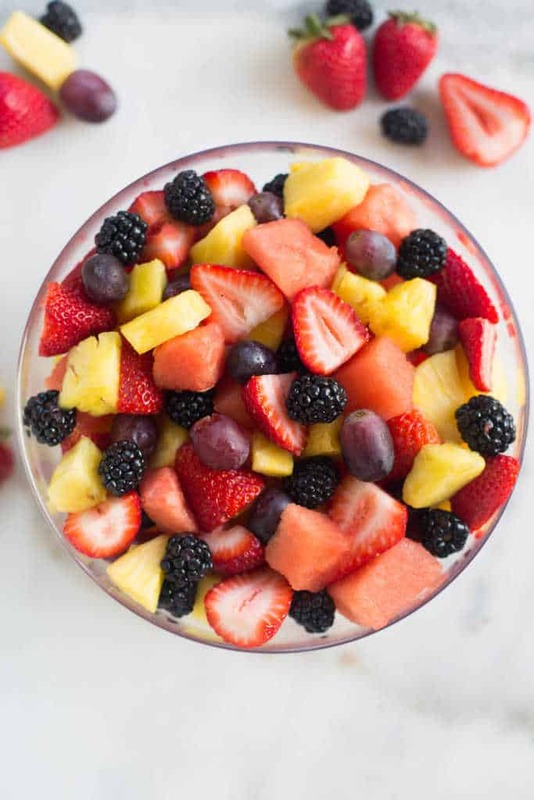 Take advantage of your favorite seasonal fruits to put together the BEST fresh fruit bowl! I've got a few easy tips for cutting, storing and assembling your fruit so that it tastes and looks amazing. Any other fruit you enjoy or that is in season! 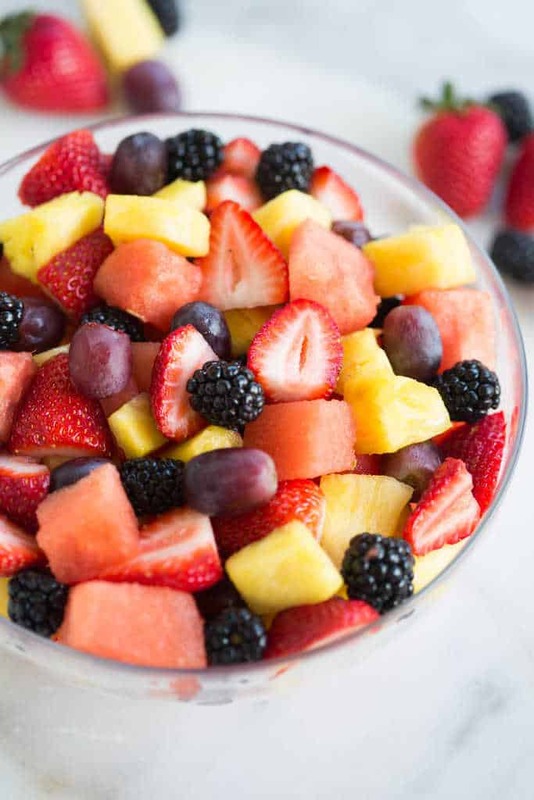 Cut fruit into small pieces. Store each type of fruit separately, in ziplock bags. Place 1 or 2 pieces of folded paper towel in the bottom of the ziplock bags containing the really juicy fruits, like watermelon and pineapple. Refrigerate until ready to serve. When ready to serve, add everything to a serving bowl and serve immediately. So easy and kid friendly. Thanks for the idea. Looks delicious and great ideas. However, it indicates prep time is 10 minutes….how can this be! Looks like about 2-3 hours worth of work!